Are you looking for a new drink this hot summer season? Watermelon and Rosemary Infused Water Recipe is perfect for you! This recipe features Watermelon and Rosemary, which not only tastes and smell good but is also healthy! Watermelon – helps you gain a high amount of vitamins, minerals, as well as antioxidants. It also decreases the risk of obesity, diabetes and heart disease. Rosemary – helps improve digestion and also contains antioxidants and anti-inflammatory compounds. Place rosemary in a pitcher and massage gently using a wooden spoon. Add watermelon to the pitcher and gently squash using a wooden spoon. Add water to the mixture and refrigerate until ready to serve. 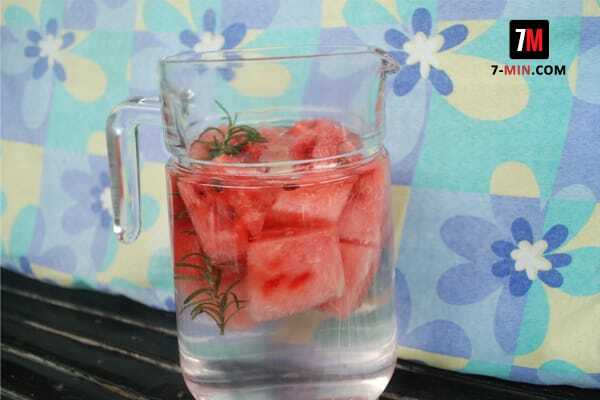 It is suggested to mash the watermelon and rosemary to release their flavors. This recipe can last up to three days in the fridge.